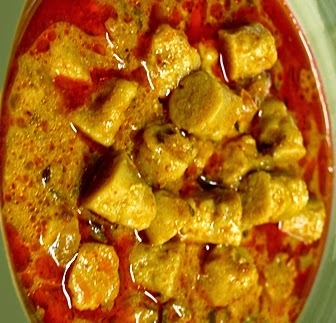 Indian besan ke gatte ki sabzi is a very famous dish from the land of Rajasthan. 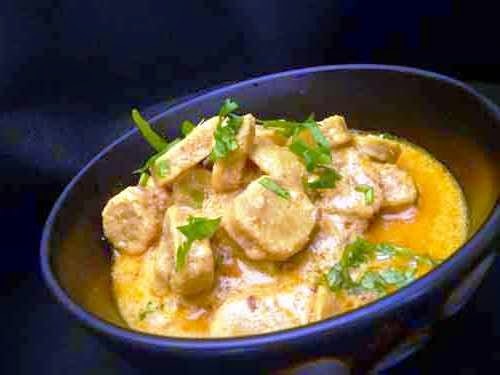 Besan gatta curry is gram flour dumpling in curd curry. 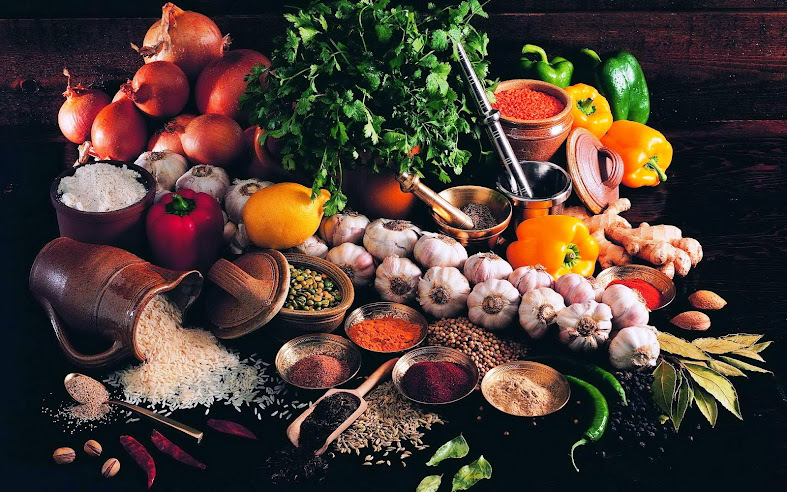 It is an integral part of the Rajasthan thali. In a bowl mix together besan, jeera (cumin seeds) fennel seeds, salt, chilly powder, hing (asafetida), coarsely crushed cloves and black pepper corns, baking soda and oil. Then add the curd and mix well. Next with the help of little water knead a stiff dough just like for rotis. Make sure to add water little by little so that the dough should not get extra soft. Now divide the dough into 6-7 parts. Roll each part into cylindrical tubes of ½ inch in diameter and 4-5 inches long. Boil 4 cups of water and place these rolls in it. Let it cook for 15 minutes or till the rolls get cooked from inside. Cut a piece to check if they are cooked properly and evenly. Otherwise cook some more. Then turn off the flame and take out the rolls from the water and keep aside. Cut the rolls into 1 inch pieces. In a kadai heat the pan and put jeera. When it begins to crackle add the onion paste prepared before. Fry the onion paste till light brown in colour. Then add the chilly powder, turmeric powder, coriander powder and garam masala. Fry for another 2 minutes. Now lower the flame and slowly add the whisked curd. Stir well and continue cooking till oil separates. Stir once in a while so that the mixture does not get burnt. Now add the gatta water separated earlier. Bring it to a boil and then add the cut gate pieces. Let the curry simmer for 5-10 more minutes on low flame. 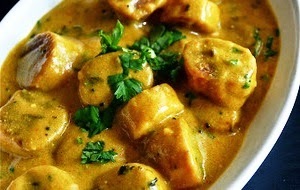 Then add the fenugreek leaves.